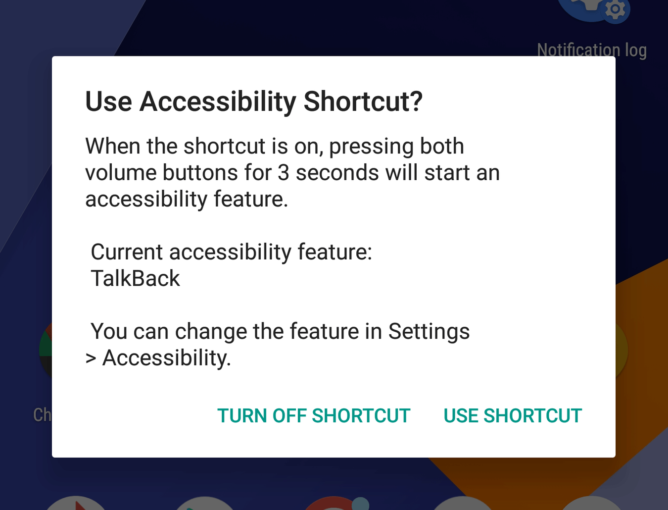 Over the years, Android has built up a decent array of accessibility options to help make devices easier to use for its diverse user base. Each new version of the OS attempts to add even more useful features, and Android O is no different. So far we've had 3 developer previews of Android 8.0 ahead of its launch later this summer, and at some point along the way Google added a couple of new accessibility features. Namely, separate volume controls and a new way to use the accessibility shortcut. The addition of a separate volume control, in particular, is one of those changes where you wonder why it wasn't always that way. Picture the scene: You have TalkBack enabled and you're listening to music. Then, you decide to increase or decrease the volume of the music. The previous behavior would alter both the volume of the music and the TalkBack app together, which could lead to frustration. Thankfully the Android devs have seen sense and separated accessibility volume from media volume. This is a welcome change and one that will be particularly useful for blind or partially blind users. The other addition is a new way to enable the accessibility shortcut. This is for easily turning the accessibility service on and off from any screen. Once you've enabled the shortcut in settings you simply hold the volume up and down buttons at the same time for 3 seconds to activate it, and repeat to deactivate. It might be a bit fiddly for some, but I managed to get it working ok. To again use TalkBack as an example, partially blind users could use this shortcut to turn the service off when they don't need it. The shortcut can be assigned to any installed app with accessibility permissions, though, so you can use it for lots of things. I tried it out for the first time as a method for turning Twilight's blue light filter on and off (useful for taking screenshots) and it worked pretty well. If you want to give Android O a try you can do so by signing up for the beta. Seeing as though it's a beta it's obviously still subject to plenty of bugs, so proceed with caution. The final version of Android O(reo?) 8.0 will be out in a couple of months, so there's not too long to wait if you don't want to check out the Developer Preview.